Offered is a 47-card near set of R145 Gum, Inc. "Superman" Low Numbers non-sports cards issued in 1940. 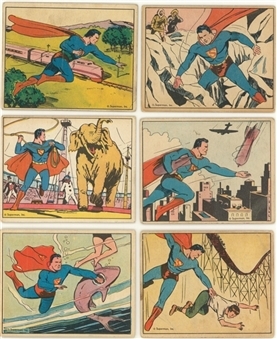 "The Man of Steel" is portrayed in action illustrations on the obverse while the backs feature detailed text. Highlights of the gallery include: #48 "Death in the Air." Missing #1 for completion. Grades 21% VG to VG/EX (mostly VG), 40% GD to GD/VG, 39% lesser. Please note: The title has changed from its original, published version. This is a 47-card near set of "Low Numbers."